What Version of Uno Was That?! 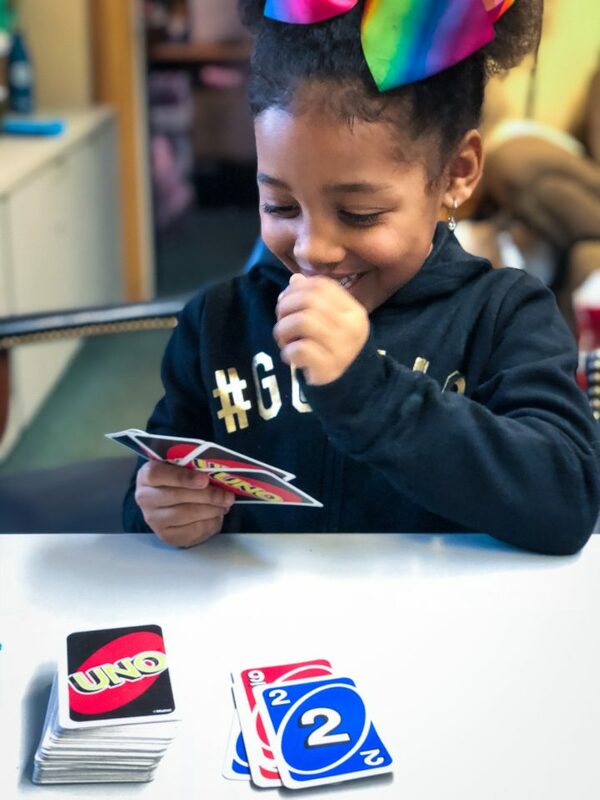 I was at a desk minding my own business when I heard, “I’m bored does anyone have any games?” I saw this as an opportunity to add another Uno win to my career, so I took out my deck of Uno cards and asked her if she knew how to play Uno. She responded, “yes, you get seven cards and you match the colors and numbers, then I say Uno and win.” This explanation was close enough, so I agreed to play with her. After dealing the cards, she went first. First move: a red 2 card placed over the blue 4. Wait…wait…that’s not how you play Uno! I said, “wait, you didn’t match the colors or the numbers!” She didn’t pay me any mind and without hesitation she put down a red 9. “Wait, it’s not your turn yet!” Instead of waiting for my first card, she searched through her cards and put down a blue 2. The game was suddenly slipping away from me! I put a blue 6 down on the pile and she followed with a green 2. The game belonged to her at this point and I didn’t know how to recover. Do I compromise the integrity of the game and disregard my morals by quickly putting down five random cards at one time? No way, Geremy, you’re better than that! I’d just been hustled. Bamboozled. Swindled. Finessed. I was the man at the pool hall and she was Uncle Phil. I owe her a dollar. When I was in 5th grade, I asked the most popular girl in the grade to go with me. If you’re not familiar with 90’s sayings, “would you go with me” is another way of saying, “would you give me the esteemed honor of being your boyfriend?” I anxiously awaited my fate as her potential boo when she gave her response on a paper to her friend to deliver to me. I unfolded the paper to reveal her answer: Nah. I sighed and thought, “oh well” and continued-on with my life. I was completely unfazed by the rejection because I never expected her to say yes in the first place. The ten-year-old me wasn’t confident and had a speaking voice that sounded like a screaming rubber chicken, so it wasn’t as if I was a contender for “most desirable” in the yearbook. But the one thing that I had was hope, so I would always convince myself to attempt things that would make me overjoyed if they happened, but were highly unlikely. It’s like being on the basketball team and shooting mostly full-court shots because if you score it’s way more exciting than a boring layup. In my mind, the 2% possibility of success is better than a 100% guarantee of failure by never making an attempt to see if the shot would have been successful. This method of “taking unlikely shots” has led to countless rejections since fifth grade, but I respond by taking more shots than ever before. Because, why not? I’ve got nothing to lose and everything to gain. 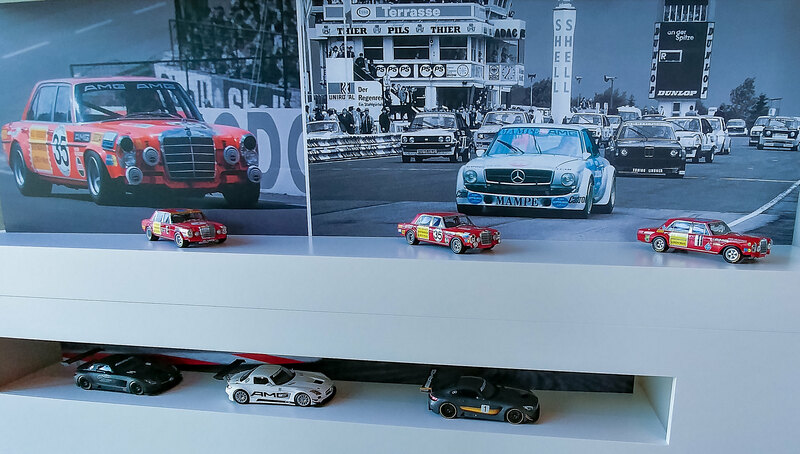 Two weeks later, we arrived at Mercedes AMG in Affalterbach, and saw no one there. The place was dead silent and not a single person was around. 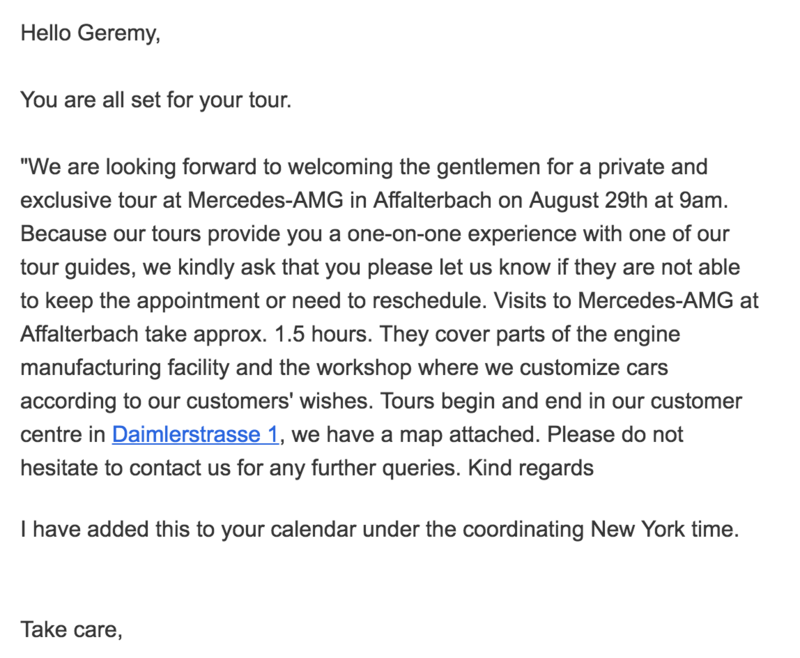 I figured that the jig was up and this was an elaborate prank, but then the concierge told us to go into the Mercedes Lounge where a server will prepare a drink for us as we wait for the tour guide to arrive. Then he walked us to the front of the building where he showed us the US flag that they mounted because they knew that we were visiting from America. WHAT?! 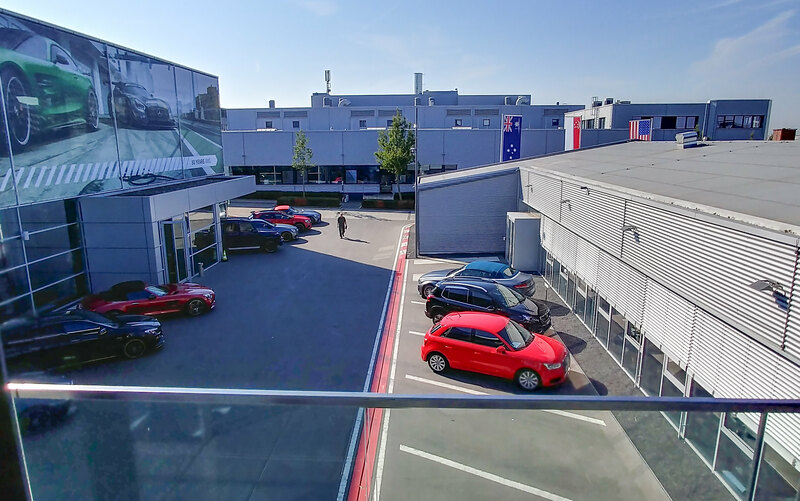 Then we went to the AMG Engine shop where we saw every Mercedes AMG engine being built by hand and were able to see the people building the engine. IS THIS FOR REAL?! 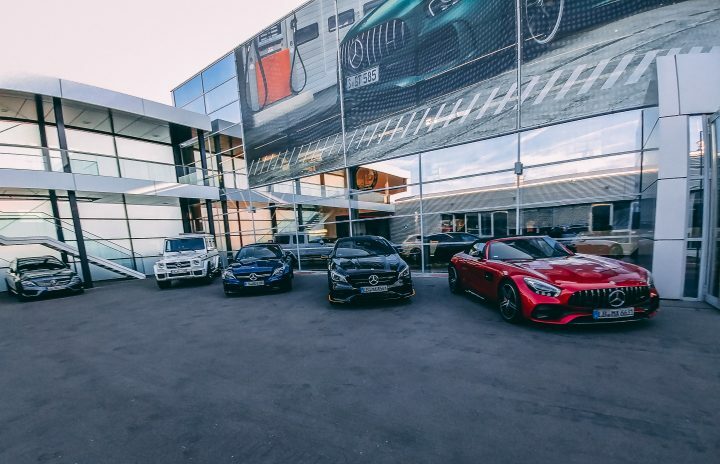 By the end of the tour, we got an amazing behind-the-scenes tour of Mercedes AMG factory with a personal guide who was eager to answer the most challenging questions. 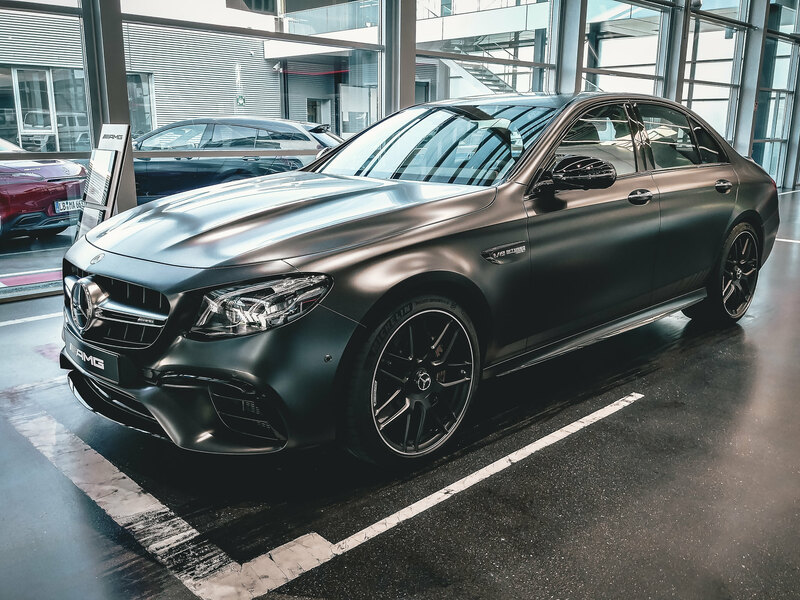 As car enthusiasts, our minds were blown, and as a risk-taker I was amazed that the simple email that started with “I would love to take a Mercedes AMG factory tour” resulted in one of the best auto experiences that I’ve had in my life. Now, it’s time to shoot more impossible shots. Brb, I’ve got to write an email to Elon Musk to ask him for a free Falcon 9 rocket to keep in my backyard. I took a trip to Switzerland with my brother for one day. An entire episode about an egg cooker. New Geremy’s Peculiar Week videos every Wednesday. The entire month of June! New Geremy’s Peculiar Week videos every Monday.